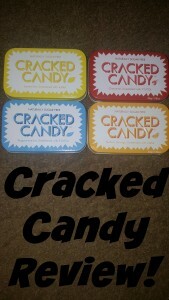 Cracked Candy sent me a few varieties of their candy to review and I loved them! They are sweetened with Xylitol which has been my favorite sugar substitute since I discovered it a few years ago. They have a nice mildly sweet flavor and the candy has a unique texture that is somewhat similar to sugar crystal candy. All 4 flavors are wonderful but I preferred the Orange and Lemon flavors to the Cinnamon and Peppermint but that is obviously subjective. If you would like to pick up a box for yourself, you can find them at Whole Foods or order them directly from the Cracked Candy Website. Please watch my video review for more details. PREVIOUS POST Previous post: 3/2 Weightloss Wednesday: 18 Lbs Down! NEXT POST Next post: Sugar Free Cauliflower Mash Recipe!